26-Apr-2015 -- As I was in the area for the annual meeting of the Association of American Geographers in Chicago, I couldn't resist a 36 hour visit to nearby Wisconsin. I have a tradition, over 10 years old, of visiting confluence points after the AAG meetings ended, including last year's visit to a freeway off ramp in Florida, a drive to a playa in the Basin and Range area west of Las Vegas in 2009, and starting way back in 2003 with a swampy and spooky walk to the backwoods near New Orleans, Louisiana. This year, after visiting some dear relatives of mine in Manitowoc, I had a few hours before my final visit of the day. Would I have enough time to visit 45 North 88 West? No guts, no glory, I said as I took off on Interstate Highway 43 toward Green Bay. There was a much closer point to my current location, that of 44 North 88 West, but I had attempted it a few years before, and as the entire area is (1) in a wetland, and (2) posted with large no trespassing signs, I declined to return there. I may never return there. Little did I know that I would get plenty wet at 45 North 88 West, which I had been suspecting, but did not fully realize at this point how wet I would become. At the moment, I was driving north-northwest, spying Lambeau Field on the horizon as I passed through Green Bay, and then north on US Highway 141 when the freeway ended. This was my first time on this road, probably since I was a child, and it was lined on both sides by deciduous trees giving way to the conifers of northern Wisconsin. The sun was bright and it was a mid spring glorious day in America's Dairyland. At Sunny Brook Road, I drove east, then north on Belgian Road, and then east on Lawler Road, past some beautiful farmsteads and fields. I turned south on Dermit Road and parked a short way down the one lane track. Gathering supplies and looking straight south ahead of me, the trail into the trees looked exactly as I had expected it. A short while after passing into the trees, I encountered a No Trespassing sign, which I had not expected as I thought this was a snowmobile trail in winter. But no matter, rather than trespass, I began the trek to the east. Deciding right away not to worry about getting my shoes wet was the easy part. Getting a lot more than my shoes wet was quite a bit more difficult: For the next 25 minutes, I made extremely slow progress, stepping in thigh-high swamp waters, not seeing what was beneath the water's surface, stepping on slippery hummocks, logs, and rocks, and breaking through sharp branches. The only good thing is that the water was not as cold as it could have been, and the sun was out, with a temperature nearly 60 F. My sole goal was not to fall headfirst and get my GPS and phone wet. Despite all of this, it was good to see a wetland - close up! I do love wetlands, it's just that I seldom relish the task of wading through them. After what seemed like an eternity, I emerged on the other side, in a thick forest, where another eternity seemed to pass before I could zero out the GPS given the overhead canopy. Even zeroing out the GPS was difficult; the ground was strewn with fallen trees, and I really had to watch my step. The "zero point" kept wandering for tens of meters at a time. I was just about ready to give up when I finally achieved my goal, and now I really needed to make haste to make my next appointment. 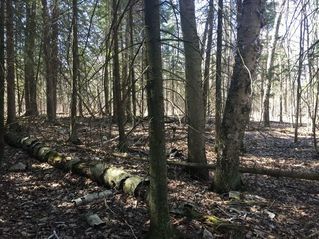 The confluence lies on the western edge of this part of the forest, and surely, the confluence could be reached on solid ground if approached from the southeast, though a stop at the landowner's home would be prudent. It was just about noon, late April, mid Spring, in Wisconsin. The land was just warming up for springtime; it had been cold up until just yesterday, actually. I had stood on 44 North a handful of times, from South Dakota on the west to Maine on the east. I had stood on 88 West several times as well, from Michigan one degree north of here, and an attempt to stand on a spot on the grounds of a power plant in Alabama on the south end, with points in Illinois in between. This was indeed a beautiful spot here in the Wisconsin glacial terrain; even though the total hike time was probably 45 minutes, it was one of the most difficult for me. Now I pondered: How to get back to the vehicle? Always wanting to take a loop as a geographer, I struck out to the north, hoping against hope that the trek would be less wet. Unfortunately, it was actually wetter than the other route. Part of it was in a wet meadow, but another part was in a very difficult to navigate wet forest, and I nearly lost my footing several times. Just before the end, I traversed a rather wide channel that had been blazed through the trees. The depth here was just about up to my waist. Afterwards, it was an easy hike to the west through the south end of the field, and seeing the vehicle in the distance was a welcome sight. Once there, I changed out of my clothes, which were work clothes, actually, into other work clothes. Then I wrung out my wet items. Later today, I had to get on the airplane, and I had no way to dry them. Well, I had a long drive back to Chicago, so I draped the clothes as best I could on the rental car floor in the hopes that the sun could dry them a tiny bit. It was a beautiful spot there looking at the fields and farms, but I was late, and drove out the way I came, back to Manitowoc. It was a great way to spend my last morning in Wisconsin! #1: The site of 45 North 88 West, in the foreground, looking southwest. #2: Joseph Kerski at 45 North 88 West. #3: GPS reading at the confluence point. #9: Marsh encountered to and from the confluence point; this scene about 300 meters north-northwest of the confluence, looking toward the confluence point. #10: 360-degree panorama movie with sound filmed at the confluence site (MPG format).